Indonesia underwent a great transformation in the latter half of the 1990s. This was because the Indonesian economy sustained a heavy blow from the impact of the Asian economic crisis. Then with the fall of the 32-year-long authoritarian Suharto regime, Indonesia entered an age of democratization and decentralization. It became much easier than before for foreigners to conduct research. What was occurring in the regions during this transformation? One of the aims of the Makassar Field Station (hereafter MKSFS) was to answer this question. 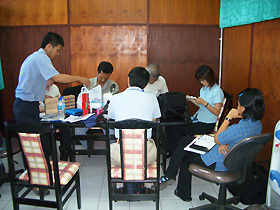 The MKSFS set up the MKSFS-UNHAS joint laboratory on the campus of Hasanuddin University on September 9, 2003 as a base for research activities. As of March 2004 three ASAFAS graduate students had been sent there. In FY2004 the Grants-in-Aid for Scientific Research project, "Natural Resource Management and Socio-Economic Changes under Decentralization in Indonesia: For Sulawesi Area Studies" (Scientific Research (A) (2) overseas scientific research) with TANAKA Koji (CSEAS faculty member) as research director was launched, and a system was set up for joint research in earnest with UNHAS. 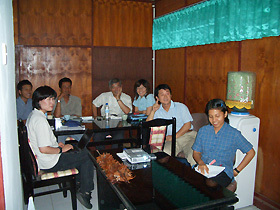 In August the same year a total of 19 persons, from both Japan and UNHAS, joined by three ASAFAS graduate students (two of them -- SHIMAGAMI Motoko, who enrolled as a third year student in FY2003, and Andi Amri, who enrolled in FY2000 -- were conducting research for their doctoral dissertations) and the other, TAKAHASHI Masakazu , who enrolled in FY2002, was doing research for a preliminary doctoral dissertation), did preliminary research for about a week in South Sulawesi Province. After that an ASAFAS graduate student (KUSUDA Kenta, enrolled in FY2001) was sent to MKSFS in November for work on his doctoral dissertation, and in December CSEAS faculty member TANAKA Koji was sent to MKSFS to provide supervision to KUSUDA and to coordinate joint research with UNHAS. 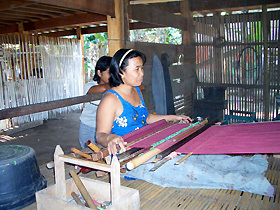 In FY2005 joint research that included the ASAFAS graduate students and UNHAS graduate students began in earnest, mainly in Tanah Toraja District and Luwu District in South Sulawesi Province and in Spermonde Archipelago. To this end, in addition to the basic provisions for on-site research in FY2003 and FY2004, we have laid the groundwork for supporting UNHAS and ASAFAS to jointly educate graduate students and to conduct joint research. Support for educational activities and joint research: provision of a portable projector/ a Sulawesi area studies reference room and Sulawesi Island topographical maps. Of the research activities support this fiscal year, the collection of doctoral dissertations and other literature on Sulawesi and the purchase of marine charts of the sea areas surrounding Sulawesi are particularly noteworthy. So far 232 books and 386 maps, both land and marine, have been acquired. These materials are often difficult to get, even in Indonesia, and they include items which are not stored in the database of the CSEAS library or map room. It is definitely important for students to give their full attention to the research work in the field, but it is also necessary to have the means of resolving small questions on the site. MKSFS's role is to provide an environment in which, not only Japanese graduate students, but Indonesian graduate students as well, can freely utilize these literature and references at any time.